HadTH is an analysis of tropospheric humidity from radiosondes [the Hadley Centre gridded homogenized radiosonde humidity dataset (HadTH)], to estimate trends and uncertainty in both relative and specific humidity across the Northern Hemisphere over the last 30 years. These data provide vertical resolution not available in many long-term surface or satellite-based measurements, and build upon earlier analyses of the radiosonde data, therefore complementing and building the existing evidence base. The purpose of HadTH is specifically to determine whether the radiosondes provide sufficient evidence to confidently reject the null hypothesis that relative humidity in the troposphere has remained at a constant level through recent climate change. 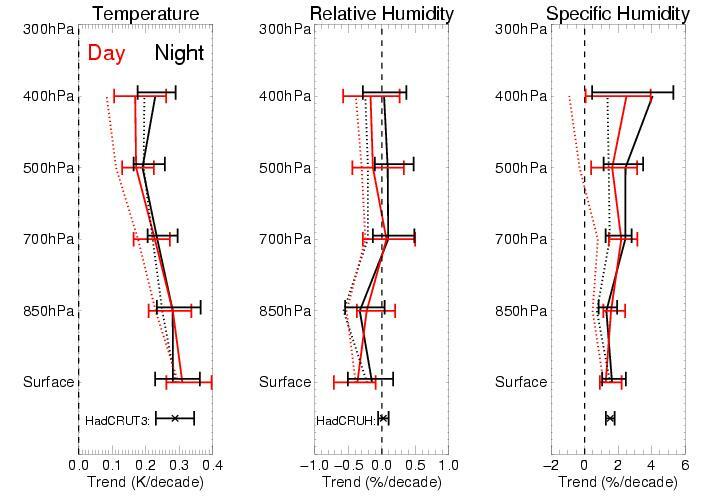 Therefore, due care should be taken if HadTH is used for other applications because the historical biases affecting the radiosonde humidity data have not yet been as rigorously assessed as those for temperature. This website contains data from a number of stages of the dataset development, so that the biases, their origin, and the associated adjustments are made clear. The methodology follows closely that described in QUARC and the documents linked below. The figure above has been taken from McCarthy et al. (2009). See the paper for more information. It shows estimates of northern extra-tropical trends between 1973 and 2003. Dashed lines are the unadjusted data, solid lines and error bars are from HadTH.